So… Star Wars. We all know it, we all love it, and for good reason. Regardless of one’s opinion of the series, it’s one of the largest (if not simply the largest) cultural phenomena of all time. And with a new film in the series finally gracing theaters this year, EA has released the long-awaited followup to the decade old Battlefront series. The original games were tactical shooters focusing on large-scale battles within the Star Wars universe, offering a variety of playable soldier types and the occasional ability to take the role of Star Wars heroes or villains that can cut a swath through the enemy troops. DICE, the developers behind the Battlefield series, were tasked with bringing the series back, and the result is… mixed. Pretty awesome, but mixed nonetheless. 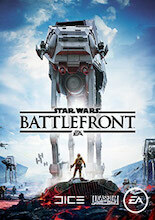 Battlefront is a first-person shooter (with the option for a third-person perspective) that pits the forces of the Empire against the armies of the Rebellion. Players take up arms on one of these two sides of the conflict in a variety of locations inspired by the films, and attempt to accomplish an objective before the other team does. This objective ranges from simply destroying the other team to multi-stage sieges escorting AT-AT walkers to a rebel encampment. But before we talk about how well the game works, let’s go over its content. Battlefront is about as violent as the Star Wars movies, at least before the darker Revenge of the Sith. Lasers fly, ships explode, and lightsabers cut down enemy troops, but there’s no blood or gore at all. The player will be shooting countless other players, and lasers bring down their targets in a shower of sparks rather than blood. Star Wars, of course, includes the mystical Force, an energy that exists in everything across the galaxy and can be used by certain individuals. The game never speaks of it, really, due to the lack of a single-player mode with any notable level of exposition or worldbuilding, but characters like Luke Skywalker and Darth Vader can use the Force in various ways during gameplay. Since this is a multiplayer game, half the players fight for the rebellion and half fight for the Empire. But playing for the bad guys is never depicted as a positive thing, and players are never asked to sympathize with the Empire’s tyranny; it’s just for the sake of having two opposing armies in the gameplay. A Child’s Perspective: You get to be in Star Wars battles. 10-year old me would have freaked out over this game. I’ll get the negative stuff over with first; Battlefront doesn’t have enough content. It’s a multiplayer-only shooter with enough maps and gametypes to provide a variety of experiences, but compared to many other $60 games it simply lacks stuff to do. And ultimately, while the soul of Battlefront is recognizable, the game has taken a lot of cues from more modern shooters, which sometimes improves it and sometimes simply makes it blend in to the glut of such games that have flooded the market lately. But ultimately, it’s a solid multiplayer game with fluid controls, exciting gametypes, and most importantly, a pitch perfect depiction of a Star Wars battle. This game is, thus far, the closest we’ve come to living the exciting moments of the series, and for a long-time fan of the series, it’s just plain exciting. I love trying to pick off rebel forces as an AT-AT trudges slowly to its target beside me, I love running through the underbrush on the forest moon of Endor while Imperial lasers fly past me, I love taking the role of Luke Skywalker and wreaking havoc among the enemy forces. If games like Call of Duty: Modern Warfare perfected the atmosphere of tense, hectic battlefields, Star Wars: Battlefront did the same thing specifically for that galaxy far, far away. So if you want a mechanically unique shooter or a rich story-based experience, Battlefront simply isn’t for you. But if you love Star Wars, I find it difficult not to recommend this game. And the T-rating ensures that if your child is mature enough to watch the movies, I find little reason they wouldn’t be mature enough to handle this game.